Motor sport in the UAE will be given a fresh boost later this year with the launch of a new national rally championship featuring four Baja-style cross country events. The UAE Desert Championship is being introduced to safeguard the future of rallying on a national basis and meets a growing demand from the country’s motor sport fraternity for a new series of highly competitive events run in a natural environment, with an emphasis on safety. The inaugural 2013-14 series will take place in October, November, January and February, with categories for cross country cars, cross country buggies, motor cycles and quads. The new championship is being organised by the Emirates Motor Sport Federation (EMSF) with the full support of the Automobile and Touring Club of the UAE, the national motor sport authority. It signifies the beginning of a new sporting partnership between the two organisations, just three months after the appointment of ATCUAE President Dr Mohammed Ben Sulayem as the EMSF President. The origins of UAE motor sport are traced back to the first rallies staged in the 1970s, leading to the launch of the Dubai International Rally, the nation’s longest running international sporting event. “They will complement each other,” said Dr Sulayem. 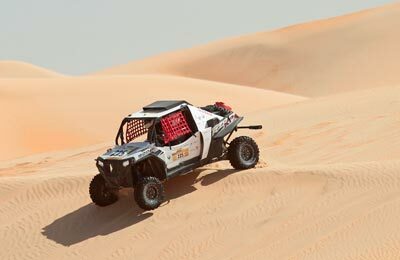 “Up until now, the Desert Challenge was the only cross country rally in the UAE. It meant there was a lack of incentive for people to buy cross country rally vehicles, and limited opportunities for them to attract and reward sponsors. “The new championship solves those problems, and also offers a series of events which can be used as training and preparation for the much longer stages of the Desert Challenge,” he added. The UAE Desert Championship will incorporate three kind of event formats, starting with short track rallies with a marked route, run over around six laps of approximately 20km each, ideally suited to the deserts of Dubai and the Northern Emirates.